Below are some common website-related questions at UCSF. If your issue isn't addressed here, check the resources on the Help page. How do I request a UCSF subdomain name for my new website? What do I do with my website if I no longer need it? Why does IE not display my Drupal website layout properly? How can I change the frequency or turn off Security and other updates per the email notifications I receive? How can I activate my site’s maintenance mode during major renovations? How can I block robots from creating fake user accounts? How can I change my site's name? How can I customize my site's error messages? How can I save old versions of a page? How do I upgrade from Starter Kit 1.0 to Starter Kit 2.0? Why do I see a transparent orange/pink background on a webpage? Is Google Analytics still supported by IT? How do I enable the new Siteimprove Analytics on my site? How can I add a banner or slideshow to my homepage? How can I adjust my slideshow's animation speed? How can I add a secondary page banner? How can I create an RSS feed? How can I create a block? How can I add a block beneath the main content area? How can I add a block to the sidebar? How can I rearrange the order of blocks? How can I pull in events from the UCSF Events Calendar? How can I create my own events? I get "Access Denied" when accessing the browser server to retrieve image files. I noticed multiple small files uploaded to my site by the user "anonymous". Should I be worried there was a breach of my website? How can I delete or disable a menu item? How can I add a menu item? How can I rearrange menu items? How can I lock my menu to the top of the site? How can I pull in news from UCSF.edu? How can I create my own news? How can I pull in UCSF profile information? I'm getting an error message when trying to add someone. How do I get around it? How can I customize the People page to list the PI first? How can I add a sidebar? How can I change my website's styling? How can I use the content formatting toolbar? You don't have to apply Security or other updates mentioned in these emails as IT Web Services takes care of this for you. While we don't always apply all the feature updates, we meet weekly to review and install the security updates. To modify or disable these messages, visit Reports > Available Updates > Settings. Under "Check for updates," select "weekly". Under "E-mail notification threshold," select "Only security updates". And finally, if you don't want to receive these emails at all, clear any email addresses in the "E-mail addresses to notify when updates are available." Official UCSF websites will receive a subdomain of ucsf.edu (i.e. websites.ucsf.edu). Choose an address that is short, memorable and comprehensible to people outside of your specific group. If you are creating a Drupal-based website, including a UCSF Site Builder template, then your domain name request will be part your Drupal Web Hosting Request. What is the record type? "A record"
What is the faceplate? This is your website address, such as "websites.ucsf.edu." What is the location of this device? If the server is virtual put your office location for the location. What is the IP network? Put the IP of the server here, such as "128.218.22.105"
Be sure to have a long-term plan when creating any website because there are risks involved when your website is no longer active. For instance, websites that stop getting security updates can get easily hacked, and outdated content can wreak havoc on UCSF's overall search engine optimization (SEO). If you only need a website for a limited time period, first consider if you can simply add a section to an existing website. It is generally not recommended to create a new website for a short-term project. When you are ready to retire a website or if you are leaving UCSF with no successor to maintain your website, email [email protected] to get instructions on how to properly handle your website. Many UCSF desktops, especially those in clinics, have IE 8 installed, but it's configured to view the web as IE 7 so that legacy web applications will run "normally". In the top-most menu, toggle off Compatibility Mode for IE7 and toggle it on for IE 8 or IE 9. If you're a site administrator, you can activate your site's maintenance mode by visiting Configuration > Development > Maintenance Mode. Check "Put site into maintenance mode" and modify your display message, if desired. Click "Save configuration." To turn maintenance mode off, uncheck "Put site into maintenance mode" and save again. Visit Configuration > People > Account settings. Find the section titled REGISTRATION AND CANCELLATION. Under "Who can register accounts? ", select Administrators Only. Under "When cancelling a user account", select Disable the account and keep its content. Click "Save configuration" at the bottom of the page. Visit Configuration > System > Site Information. Change the title in the Site Name field. Click "Save Configuration". When logged in, click on Modules in the administration menu. Find the module titled Custom Error and check the box next to its name. Click "Save configuration" on the left side of the page. Now that the module is activated, go to Configuration > System > Custom Error and modify your message. After saving, visit Configuration > System > Site information and change "Default 403 (access denied) page" to customerror/403 and "Default 404 (access denied) page" to customerror/404. Click "Save configuration". Go to Structure > Content Types > Page. Find the "Publishing Options" tab and check "Create new revision" under default options. Click "Save content type" at the bottom of the page. Return to Structure > Content Types > Page. Find the "Compare revisions" tab. Check boxes for "Show View changes button on node edit form" and "Enable the Revisions page for this content type". Click "Save content type." This is a short example of how to enable and configure the Web Site Verification Module using Google Webmaster Tools. This module will allow you to claim ownership of your website with several search engines. This is a characteristic of an unpublished page when in the edit view. While in edit mode, go to Publishing Options in the bottom left corner and check the box for "Published". After you Save the page, this should be resolved. We no longer support centralized Google Analytics reporting in IT. We have a new analytics product called Siteimprove, that measures a wide variety of website information. It provides accessibility, search engine optimization, and website quality reports in addition to analytics. There is no conflict if you have a Site Builder site with Siteimprove analytics and Google Analytics. You may continue to use Google Analytics, just know that we no longer support it or give out Google Analytics codes. Add the Priority Script for number of page views to help prioritize accessibility issues and fix your most-visited pages first. If your site is a Site Builder or Starter Kit Drupal template site, the Prioirity Script is already added and you should automatically see the Analytics data on your site's Siteimprove dashboard. When editing the homepage, click on "Add slider/banner to top of page" above your page title. Under Hero Template, choose Home Page Slider. To build your starting slide, upload an image, add a title, short descriptive text, and text for a button, making sure to add a link under Link URL. You can add another slide by clicking "Add a new Slide" and following the same steps. Once more slides are available, you can change their order by clicking on a slide's directional icon and dragging it up or down. For best effect, make sure that any images you upload are large enough for the resulting display and keep all written text short. Also, please note that the Home Page slider is only meant for the homepage. If used elsewhere, it will break up your site's hierarchy, creating a confusing experience for the end user. Go to Appearance > Settings > UCSF Site Builder. Under the Homepage Banner tab, you’ll see something called “Animation Speed”. Choose any value from No Autoplay to 14 Seconds and click “Save Configuration” at the bottom of the page. Edit these settings at any time. For pages other than the homepage, you can add a banner by clicking on "Add slider/banner to top of page" above your page title. Under Hero Template, choose Secondary Page Banner. Upload an image, add a title, short descriptive text, and text for a button, making sure to add a link under Link URL. A "block" is a Drupal term; think of it as a building block of content you can add to any page. The UCSF Site Builder comes with a wide range of blocks; you just need to activate them. Take advantage of these by enabling Starting Points (Structure > Starting Points) you'd like to use. You can also create custom blocks. To do so, visit Structure > Blocks > Add Blocks. Beneath the main content area you'll see two buttons labeled Text and Block. Click on Block. By default, "-None-" will be selected. Click on that dropdown to see a list of all available blocks, and select the block of your choice. Add more blocks by clicking on "Add another item". To add a block to a page's sidebar, click "Build Sidebar" on the right side of the page above the main content area. A space will appear called Sidebar Blocks. Click "Add a block". By default, "-None-" will be selected. Click on that dropdown to see a list of all available blocks, and select the block of your choice. Add more blocks by clicking on "Add another item". If you hover your mouse over the directional icon immediately to the left of any block name, you should see a mousetip that says "Drag to reorder". Move each block up or down, and Save the page once you're satisfied with their order. Under Structure > Starting Points, visit the first tab and follow the prompts to create a Blog. If you need to change your selections, revisit this section and click Create Starting Point. After this initial step, you'll be able to add authors, topics and entries. To pull content via RSS, add /feed to any blog-related URL, including filtered results (e.g. http://websites.ucsf.edu/blog/feed?topics=266). To use this feature, first visit the widget builder on calendar.ucsf.edu to choose what events you'd like to display. There are a number of options here, but focus on selecting a Department/Group or other filtering option, like Event Type or Affiliation. Scroll down and click "Generate Embed Code." Copy the code that appears. Now, go to Structure > Starting Points and click on the UCSF Widgets tab. Select "UCSF Events Calendar Integration". A space will appear asking for the embed code you just generated. Paste it into this space and click "Create Starting Point." You can then add UCSF calendar events to any page by adding a block called Starting Point - UCSF Calendar. First, if you'd like to have your own group on the UCSF Events Calendar but don't have one yet, write to [email protected]. With a group page, you'll be able to share events specific to you on both your website and the central website simultaneously. If you only want to have events specific to your site, go to Structure > Starting Points, click on "Events Calendar", and then click on "Create Starting Point." Now you can create local calendar events by going to Content > I’d like to create a: > Event. 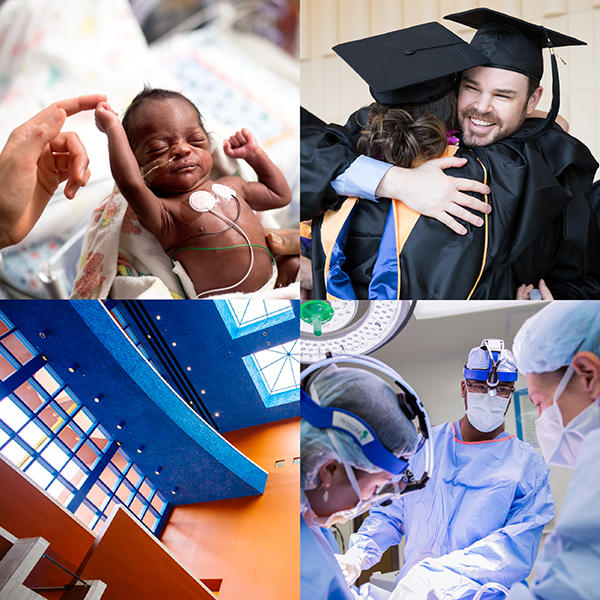 There are free images available in the UCSF Brand Photography Library. If you can't find an image that meets your needs, you are welcome to buy one from a stock photography website. However, please be sure that any images you purchase meet UCSF's brand photography guidelines. It depends where you're using them. If you need an image on your homepage, 1200px wide is a safe bet. For most other pages, 800px wide will suffice. However, please be aware that there is a file upload limit of 1.5MB. While there is no restriction on uploading an image that is too small, a picture without enough data will appear pixelated and should be replaced with a larger file. Have your site admin go to Configuration > Media > IMCE images. Verify your user role is set to "User-1" in the Public files column. Logout then log back in and try to upload files again. No, this is a known bug related to faculty updates. IT is investigating this issue. You can leave them or clean them out by going to Content > Files, sort by user and delete all the files at one time. Visit Structure > Menus > Main menu to view your current menu structure. To permanently delete a menu item, find it and click "delete" in the right column. It will ask you to confirm your choice; click "Confirm". If you want to disable a menu item, uncheck "Enabled" and click "Save configuration" at the bottom of the page. If you're looking to re-enable an automatically created Starting Point page, visit Structure > Starting Points and enable the corresponding Starting Point again. If you'd like to add a different page, visit Structure > Menus > Main menu. Under Main Menu, you'll see an option to "Add link". Click on this, enter the relevant information, and choose what its Parent menu should be. Click "Save". Visit Structure > Menus > Main menu. If you hover your mouse over the directional icon immediately to the left of any menu item, you should see a mousetip that says "Drag to reorder". You can move menu items up, down, left or right. If a menu is indented, it will become a submenu of the item above it. When you're happy with the menu order, click "Save configuration" at the bottom of the page. The menu name comes from the associated page's title. To enable this feature, go to Appearance > Settings > UCSF Site Builder and select the “Navigation” tab. Choose “Yes” and click “Save configuration”. If you change your mind, you can return here anytime to turn it off. Easy! To bring in a customized news feed, go to Structure > Starting Points and click on the UCSF Widgets tab. Select the option called "UCSF.edu News Integration". Now, pick the general news area(s) you're interested in — be sure to choose at least one — and as many topics as you'd like. Once you're done, click on "Create Starting Point". You can then add a UCSF news feed to any page by adding a block called Starting Point - UCSF News. Visit Structure > Starting Points and click on "News - Block". This will allow you to create news stories that are specific to your site. A news menu item will automatically appear in your main menu, and you can change the name of the menu item, move it, or even delete it altogether. The individual news articles you create will still be available, and you can link to them in whatever way works best for you. You can also reference them in a block by adding a Starting Point - Local News block to any page. To create a news item, visit Content > I’d like to create a: > News. Add a title, an author, an image, and the body of your news story. Save. Save time by integrating with UCSF Profiles. 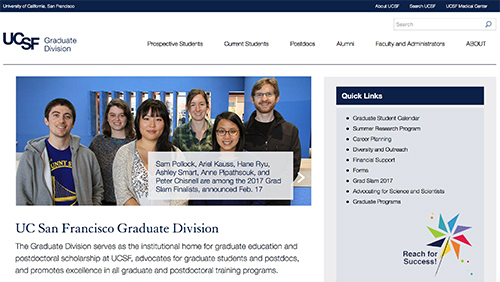 To get started, visit Structure > Starting Points, click on the UCSF Widgets tab, and then select UCSF Profiles Integration. You'll be asked if you'd like to create a grid of profiles, or an expanded view (you can revisit if you change your mind). Click "Create Starting Point"; a page will appear called People, which will initially be blank. You can now add people to this page by visiting Content > I’d like to create a: > UCSF Person. Submit their UCSF email address and upload a headshot if you have one and want to replace the default image (many faculty shots are available in the Brand Photography Library). Override any information that you'd like to customize. Then decide whether to include Publications. If you want to feature only some, add those specific ones by searching for each title with a keyword. Save. After the People menu is added, you can change the name of the menu item, move it, or even delete it altogether. The individual profile pages you’ve created will still be available, and you can link to them in whatever way works best for you. First, make sure that the person has a profile on profiles.ucsf.edu. If they don't, they should request one through their group's HR representative. If their profile exists, double check that the email you're submitting is the one affiliated with their profile. Lastly, ask the person to make sure they've allowed their information to be fully public rather than “UCSF Only” via their HR representative. To move someone to the top of the people list go to their page and click edit. Find the “publishing options” tab at the bottom of the page. Click on it. Select “Sticky at top of lists”. Click Save. Now people “sticky at top of lists” show up first in last name a-z, then everyone else last name a-z. You can add a sidebar to any page by adding a block to a page's sidebar. To do so, click "Build Sidebar" on the right side of the page above the main content area. A space will appear called Sidebar Blocks. Click "Add a block". By default, "-None-" will be selected. Click on that drop-down to see a list of all available blocks, and select the block of your choice. Add more blocks by clicking on "Add another item". Visit Content > Files > Add file. A list of supported file types is listed and buttons to choose and upload a file are provided. 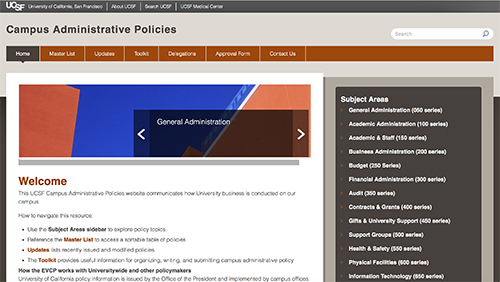 If you're using the UCSF Site Builder, it's easy to make design changes. When logged in, visit Appearance > Settings > UCSF Site Builder to select new options. To save changes, click on the "Save configuration" button at the bottom of the page. If you understand CSS, you can also add custom styles. Visit Configuration > Development > Custom CSS to add your own code. Source: Switch between a What You See Is What You Get (WYSIWYG) editor and full HTML. Headers and font sizing: Highlight the text you'd like to style and click on the dropdown list that says "Normal". Body text or paragraphs should always be "Normal", but there are a variety of different header sizes for section headings and titles. Body text styling: Highlight the text you'd like to style and press one of the following: B (bold), I (italicize), U (underline), S (strikethrough), or T (remove formatting). Align text: Align text to the left, center, or right by highlighting the text you'd like to align and then choosing one of three stacked bar icons. By default all text is left-aligned, and this setting is generally recommended. Lists: You can easily create numbered or bulleted lists to differentiate information. Make sure each list item is on a new line, and then highlight all items. Click on either the numbered or bulleted icons to create a list. Indent: Indent information to distinguish it from the rest of the page by highlighting a section and then clicking the right indent icon (small arrow facing right). Move text back by highlighting that same section of text and clicking the left indent icon. Link: Hyperlink to relevant content by highlighting contextual information and clicking the small link icon. If you'd like your link to look like a button, choose a style from the Button Link Style drop-down menu. Double click on the link to change its style again. Image: Click the landscape icon to add an image. To select a file, click "Browse server". If the file is already uploaded, select it and click "Insert file". Otherwise, click Upload, follow the steps, select it and click "Insert file". Add alternative text that describes your image. Decide how big it should be by changing the pixel width. Pick an alignment (left or right recommended), and click "Captioned Image" if you'd like to add a caption. Once added, you can double-click on an image to change these settings. Video: Click on the video play button icon and enter a Youtube, Vimeo or Dailymotion URL. Choose an alignment (left or right recommended) and a size. Double click on the video to change these settings. Quote: Under the Gear icon, click quote. Choose a background color, alignment (left or right recommended), and size. Double click on the quote's directional icon to change these settings. Columns: Under the Gear icon, choose either twoColumn or threeColumn. Select a layout (an even split is recommended) and a background color for each column. Double click on the row's directional icon to change these settings. Featured content: Under the Gear icon, select Featured Content (intended for use in a column layout). Double click on the gray image to select a file and replace text as needed. Collapsible content or FAQ: Click on the Gear icon and select “collapseItem”. A gray bar will appear. If you click on it, you can edit the title information (“Item 1”) and its content (“Enter content”). To keep an item collapsed for a user, click on it again to close it. To keep it open for a user, keep it open when saving the page.